NASSCOM signed an MOU for a Strategic Partnership with Business Sweden to foster Indo-Swedish innovation in areas of sustainability and global challenges. The program UNNATI is a by-product of the visit of Hon’ble PM of India, Shri Narendra Modi’s to Stockholm last year, wherein he signed a ‘Joint Declaration on Innovation Partnership for a Sustainable Future’ with the Swedish PM Stefan Lofven. UNNATI has large Swedish enterprises like Astra Zeneca Volvo, Ericsson, Ikea, ABB on board and getting them to narrow down their requirements so that the right Startup can be scouted for ( In India) through an application process. These Swedish Enterprises are either present in a big way in India or keen to expand in the Indian market. As touch points within these companies, UNNATI has (in most cases) their Global CTOs & Head of India Market as the nodal points to engage with. This ensures the solutions align with Indian market and at the same time fit into the overall company strategic framework. 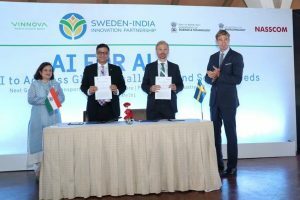 The reverse where Indian Enterprise are made to connect with Swedish Startup is in the works and will rolled out subsequently. The program enjoys support from principle bodies like Atal Innovation Mission, NITI AGNII, Invest India, DST and DBT. As a strategic partner, NASSCOM will be able to bring forth its thinking & contribution in the areas of Innovation/ AI, enable Startups to apply to thematic challenges laid down by these giants. This will create visibility, R&D and mentoring opportunities and most importantly ACCESS THE DECISION MAKERS and a GLOBAL NETWORK that can potentially Turbocharge Startups’ journey to growth. In line with the above thinking, a bilateral AI Summit “AI for all” was organize and gathered government decision makers, academic experts and leading industry executives from both countries to explore applications for AI, share best practice and provide a forum for problem curation. To mark the partnership and cross – collaborate AI capabilities in the area of Healthcare, Transportation, Industry 4.0 and Public Safety a bilateral MoU was signed between the parties at this event. NASSCOM is the only non-government partner between the two governmental agreements.